With Turkey Day approaching, I just want to make it loud and clear that yes, I do endorse eating Turkey for Thanksgiving. It is NOT ok to eat eagles. I started banging away on some of one marching band’s drums. At first there was some doubt, but then the members were shocked to discover that I actually have some rhythm! If you don’t remember, check out my drumming on Opening Day 2010 http://www.youtube.com/watch?v=yjjOWw2Mjeg. 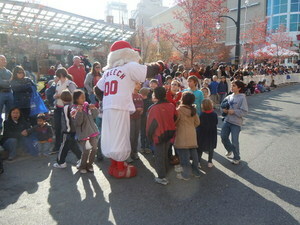 During the parade, I was able to visit slap five with so many Nationals fans, it got be excited for the 2011 season again. To the left is a picture of me hanging out with some really cool kids at the start of the parade. grabbing my legs, taking off my hat, and trying to steal my shoes! 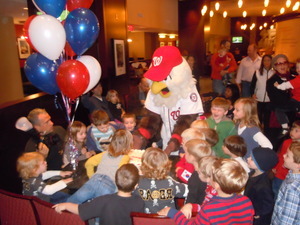 After the kids settled down a bit, we ate cake, played with a pinata and I signed autographs for everyone. Needless to say, it was a great Saturday! Have a GREAT Thanksgiving everybody, and please remember it’s a time to reflect on what we’re thankful for. One thing that I am thankful for, is having so many loyal readers of this blog like you! !